Not many of us like thinking about death — especially our own. But making plans for what happens after you’re gone is really important for the people you leave behind. So today, we’re launching a new feature that makes it easy to tell Google what you want done with your digital assets when you die or can no longer use your account. 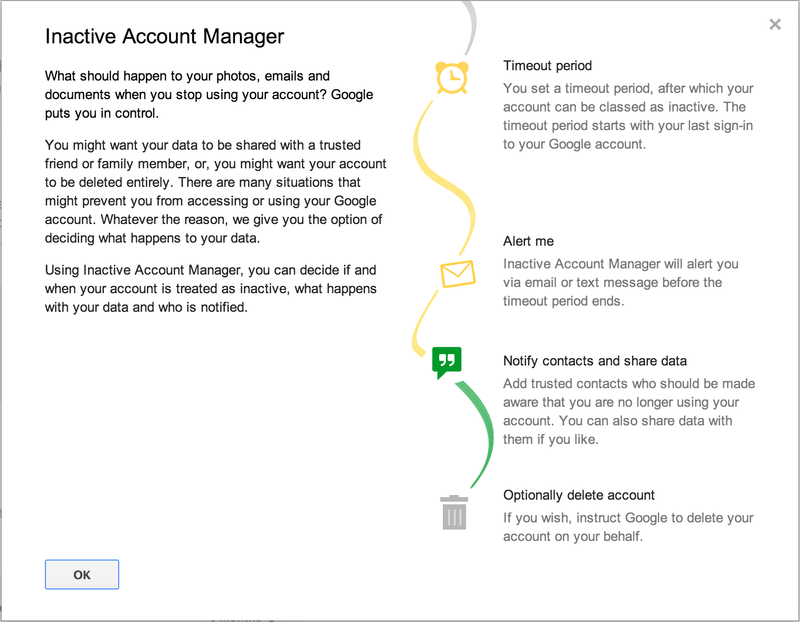 The feature is called Inactive Account Manager — not a great name, we know — and you’ll find it on your Google Account settings page. 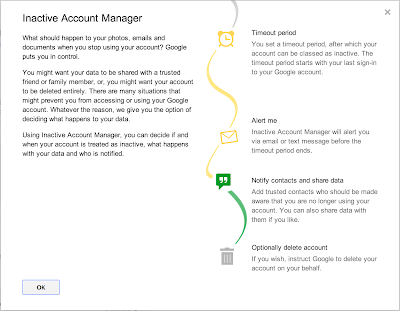 You can tell us what to do with your Gmail messages and data from several other Google services if your account becomes inactive for any reason. For example, you can choose to have your data deleted — after three, six, nine or 12 months of inactivity. Or you can select trusted contacts to receive data from some or all of the following services: +1s; Blogger; Contacts and Circles; Drive; Gmail; Google+ Profiles, Pages and Streams; Picasa Web Albums; Google Voice and YouTube. Before our systems take any action, we’ll first warn you by sending a text message to your cellphone and email to the secondary address you’ve provided. We hope that this new feature will enable you to plan your digital afterlife — in a way that protects your privacy and security — and make life easier for your loved ones after you’re gone.